The University of Hawai‘i Romanzo Adams Social Research Laboratory (RASRL) Collection contains an extensive body of student papers on urban Honolulu and rural Hawai‘i communities during the Territorial Era and beyond. The best papers offer intimate and often vibrant portraits of life in communities – plantations on all islands, urban slum areas, middle-class neighborhoods, as well as dormitories and boarding houses in which the authors lived as high school or college students. These student papers are based on their personal recollections and interviews with residents but frequently include student-created graphs of demographic information – the residents’ races and ethnicities, occupations, ages, genders, etc. – as well as hand-drawn maps, and photographs. Life at Brodie 2 [camp] was very slow and easygoing. The people took their time in walking; the cars crawled along the dirt roads. Even the dogs liked to meander along and what was even better to sleep. At night people stayed at home and read their newspapers and listened to their radios (#2079 “A Plantation Camp,” May 6, 1955). The writers themselves are varied. One paper for a sociology course is by a teacher who likely taught at Waialua High School or at least had access to the school’s records. Others were authored by children of plantation workers, including the plantation doctor’s son and the daughter of a manager. 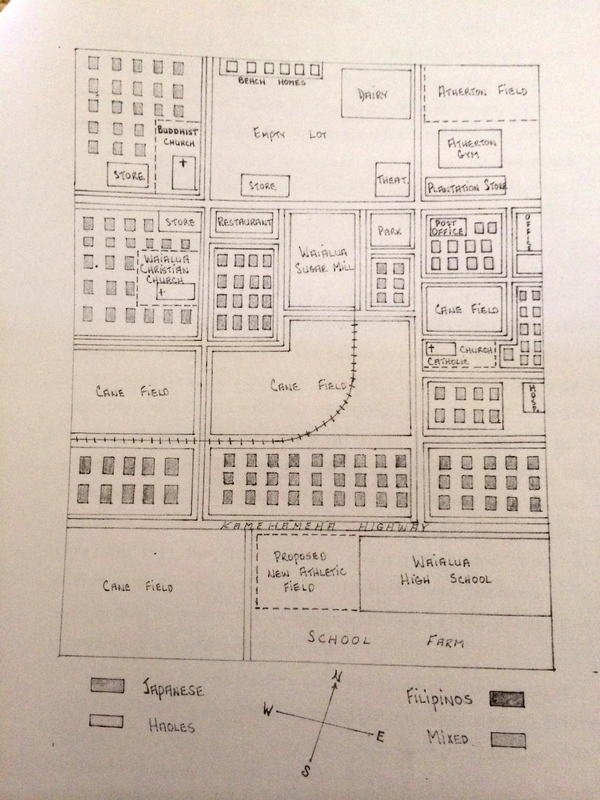 Some writers included maps with their papers. There are many officials in Waialua who are too much aware of their higher standard of living and treat the laborer and his children as people who are far inferior to him. These men are disliked very much by the laborers and as a rule their friendship is not relished by the other officials either. They are usually referred to by the laborer as “God damned haoles” (J. J. “Waialua,” June 1947). 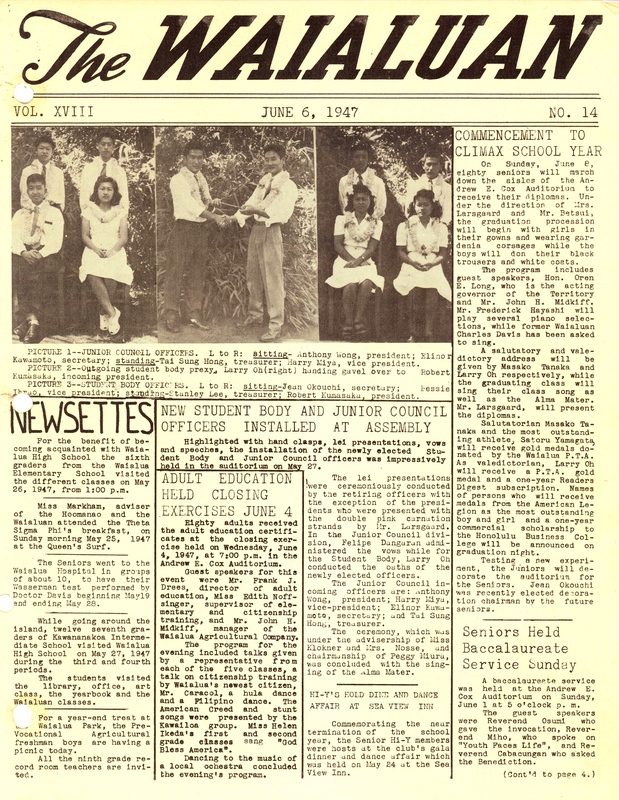 The Waialua community papers are from the latter Territorial Era and fewer in number than those from other communities for a couple of reasons: Waialua High School didn’t open until 1937, which means students weren’t able to take the necessary preparatory courses for college admission, and Waialua was a sugar plantation town far from the University of Hawai‘i in Mānoa. As for many children of plantation workers, higher education was not always a high priority, especially when the sugar mill offered familiar and nearby employment. But even those students whose families wanted them to attend UH faced considerable expense: fees, books, and the need to secure room and board in Honolulu. … I am going to school, going home once every two weeks. There are a greater portion of the family in town, but when we speak of our “home,” it is still in Waialua where [mother] raised us as kids (M. T. “The Role of the Various Members in My Family and the Nature of interaction Between Them,” likely 1942). The most important reason for making Waialua our first featured community is that the team working on this project closed the research circle by visiting the community in April 2014 to share excerpts from papers with members of O‘ahu’s North Shore communities. Rather than offer a typical lecture, the team shared copies of maps drawn by RASRL writers, a PowerPoint slide show of photos of Waialua High School graduates, and excerpts from many of their papers. We asked for volunteers from the audience to take turns reading the excerpts. Community folks, especially older ones, are used to showing up at events to be spoken to and aren’t used to being asked to read, comment, question. With some cajoling, folks volunteered to read and comment. One cheery Japanese woman, probably in her late 70s, early 80s, recalled living in Japanese Camp where she had little chance to interact with anyone other than Japanese. This led to a comment about stereotypes: she recalled her mother warning her about the Filipinos in the camp because “they were all bachelors.” And that was the loveliest way we have ever heard the all-too-common fear expressed of Filipino men. A librarian from Mililani told us that her neighbor – author of a well written paper and maker of a map that was featured in our presentation – wanted to come but couldn’t due to having a cold. His question: “How did they get my paper?” An excellent question that we will attempt to answer in subsequent posts. Presenting at community events offers challenges – inadequate publicity, perhaps a less than optimal venue, glitches in communication. But UH faculty and other scholars should look for ways to share their research with the larger community, for it’s likely if a scholar is using local research materials, like those in RASRL, the materials already belong to the larger public. The people who attended our Waialua presentation said they were grateful that we made the trip all the way out there. And as the evening progressed we could see that people liked speaking and hearing aloud what the writers had to say about their community. The pride in and affection for Waialua that made the RASRL writers’ papers stand out was abundantly evident that evening.